..... Often imitated, never duplicated, the original NYC underground-rock legend returns from the wilderness with twelve red-hot hits, each more powerful than the last! This is Garage Punk for Now People! A wizard's brew of rhythm & blues and subversive dance grooves, weaponized with sci-fi skronk and industrial attitude, calibrated for the Revolution, a Molotov cocktail of sound guaranteed to destroy any post-modern hangover! Pulsing with energy, clanging with excitement, and dripping with radioactive soul and raw emotion, Jon Spencer opens up his heart like never before, exploring man's modern condition with caustic guitars and outerworld crooning, asking and answering the musical question, "Is it possible to torch the cut-throat world of fake news and pre-fab, plastic-coated teen rebellion with the power of rock'n'roll?" THE ANSWER IS YES! 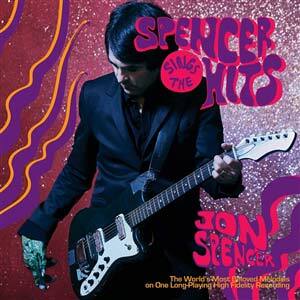 SPENCER SINGS THE HITS! This is the truth serum America has been craving, the beginning of a rock'n'roll rebellion that takes no prisoners and puts the squares on ice! Recorded and mixed with Bill Skibbe at the Key Club in Benton Harbor, MI. Featuring the talents of Sam Coomes (Quasi, Heatmeiser) and M. Sord (M. Sord).